The marble steps believed to have been climbed by Jesus before being sentenced to crucifixion have been unveiled after 300 years, Daily Mail reports. The marble steps, also known as the Scala Santa or Holy Staircase, had been covered in wood since 1723 to protect the marble from wear and tear resulting from years of use. Legit.ng gathers that the Scala Santa has, however, been restored with pilgrims now flocking to see the sacred steps. 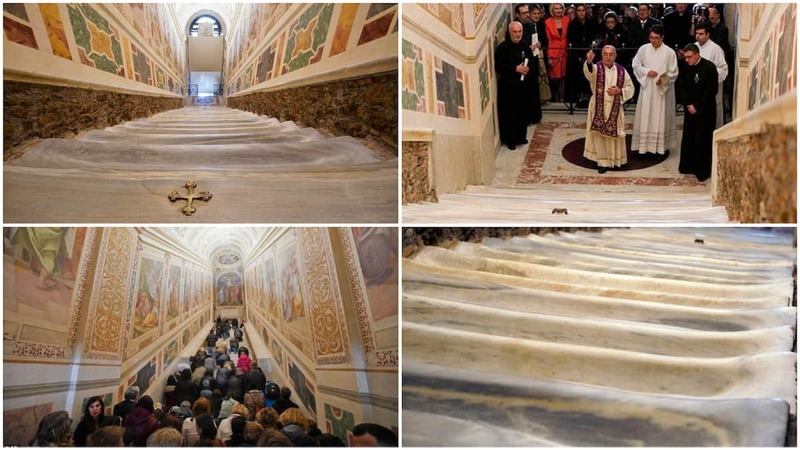 The steps were unveiled in a ceremony on Thursday, April 11, marked by the Cardinal Vicar of Rome, Angelo De Donatis, kneeling as he inaugurated the restored Holy Stairs. It will stay open to the public for 60 days, covering the Easter period, ending on June 9. Pope Innocent XIII reportedly ordered that the marble be covered about 300 years ago amid fears it was getting worn down by the hands and knees of worshipers. Experts from Vatican Museums reportedly found notes and other offerings that were shoved under the planks as the work commenced this year to see the stairs reopened. Paolo Violini, the coordinator of the restoration, said: "We found them step by step as we removed the floorboards – many, many little notes and coins, left as offerings." Guido Cornini, a curator from the museums, said: "If you close your eyes for a moment, you can imagine yourself back in the medieval era, the last time that people scaled these steps on their knees." The discovery which was maded in the ancient Byzantine village of Shivta reportedly thrilled archaeologists. Although the painting is fragmented, experts from Israel’s University of Haifa were able to make out the facial outline.